"I want to make the film I want to watch," says Gustav Möller (pictured above). He is talking about The Guilty, a quickly-involving thriller that just screened at Fantastic Fest and will open in U.S. theaters via Magnolia Pictures on October 19. 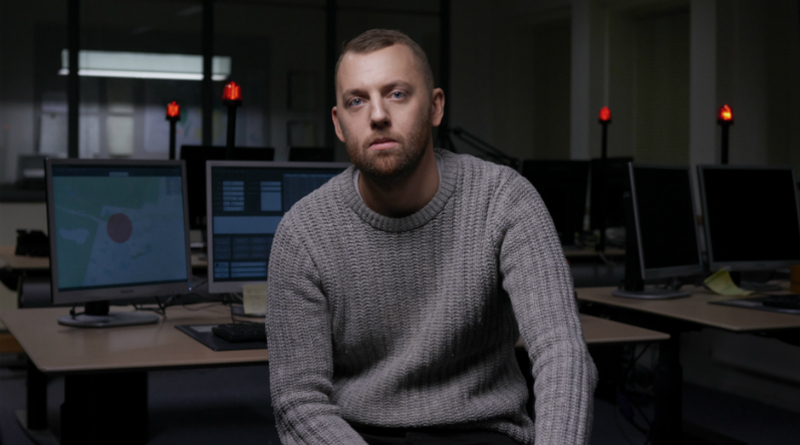 The film follows Asger Holm (Jakob Cedergren) during a night when the demoted police officer is working as an emergency dispatcher. It's a high-impact film, as I described in my review when it debuted at the Sundance Film Festival back in January. Frankly, however, its premise did not sound terribly appealing when I first heard about it. "I love a good challenge and I love that you say, 'That sounds boring,'" he told me when we sat down to talk in Austin after the screening. "Then it's a challenge to everyone making the film. Everyone knows we have to do our best and we have to maybe work harder than we ever have before and we have to be extra creative in order to make it work. "I think limitations are a very good way to heighten the creativity of everyone involved in the project." As you might expect, Möller did have more on his mind than the entertainment value of the film, but he's pretty sneaky about it. "There are definitely things I want to say with The Guilty," he says. "There's some pretty dark and complex subject matter in it that I want to discuss with the audience. The vehicle for that, and my driving force with it, was also making something that would be entertaining and be thrilling. "That is how I like to be presented to a film; I like to lean into a film when I watch it. I don't want to sit and be analytical ... I want the filmmaker to draw me into it. "What summarizes that the best is the American 70s." Pause. Beat. I write a column on American films from the 70s. I love the 70s! This totally disarmed me, because otherwise I felt like Möller is nothing like me. Born in Sweden, he is tall, good-looking, and very charming. He was drawn initially to the films of Martin Scorsese and Quentin Tarantino: "That's what I watched when I was a teenager," he said. When he was about 16, he started making shorts, and moved to Denmark when he was 20 to pursue filmmaking, feeling a greater commune with filmmakers there than in his native land. Before making The Guilty, he watched a lot of films by Sidney Lumet. Also, "Scorsese's my hero," he says. "I think what you guys did in that time was very much bringing up political subjects, bringing up complex subject matter, introducing some very complex characters, but it was always entertaining. That is what I wanted to do with this film. "To be specific about it, we talked about Taxi Driver and its themes," Möller continues. Its main character has "a psyche that is not super stable but his intentions are good. Also, in the way he views the world. "We talked about Dog Day Afternoon and how we wanted to shoot the film, and the feeling we wanted: distressed and in real time. We shot [The Guilty] with three cameras and in long takes; that was directly inspired by Sidney Lumet and how he shot Dog Day Afternoon. So, definitely, I've taken a lot from that period of filmmaking." Read more about the film at the Fantastic Fest information page and the official U.S. site.